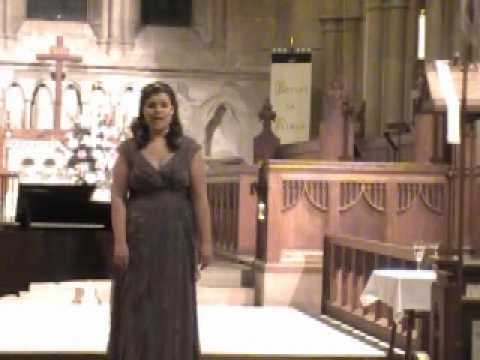 Lorene Henderson 2011 Senior Recital; Translation: Beautiful star of the earth, Amorous and beautiful light, How desires this soul, Oppressed and imprisoned, To break its chains, Free to fly to you! The unknown inhabitants that you hide from me, oh star, Embrace with the angels In pure brotherly love, Making in harmony with the angels Your sphere to sound. Our faults and worries are secrets to them there; Carefree and calm, The days and years run by, With no thought of counting them, Nor recalling them in sadness. Beautiful star of the night, Gem in which heaven delights, If only this soul could rise, this soul, Oppressed and imprisoned, From its earthly jail to your beautiful ray in flight.